In this Guillaume Le Conquerant tapestry, we see a scene based on the original showing King Harold travelling to the coast preceded by his pack of hounds. In the border we see mythological creatures moving along with the central focus of characters on their travels. This work is exquisite in its detail. 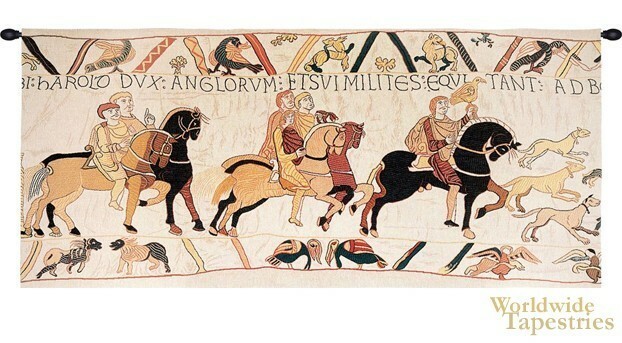 The original Bayeux Tapestry from the 11th century consists of 50 scenes commissioned by Bishop Odo, William's half-brother and created in England. The original is now housed in Musee de la Tapisserie de Bayeux in Bayeux, Normandy, France. The Guillaume Le Conquerant tapestry is backed with a lining and a tunnel for easy hanging. Note: tapestry rods and tassels, where pictured, are not included in the price. Dimensions: W 62" x H 29"